Students in Australia have recently had the wonderful chance to study and grow radish seeds that have actually spent time in space. This amazing opportunity to directly interact with an International Space Station project was made possible through the work of Space Nation partnering with Australia?s First Kids On Mars program. The seeds were flown to space on October 16, 2016 in the NanoRacks Black Box experiment module, launched aboard the Orbital ATK Cygnus cargo vehicle to the International Space Station. The seeds orbited the Earth at an altitude of 240 miles, exposed to microgravity and cosmic radiation for the duration of the mission, and returned to Earth aboard the SpaceX 10 capsule on March 19, 2017. The First Kids on Mars program, whose founder Jonathan Nalder has also been beta-testing the Space Nation app, works with learners of all ages to begin mastering creative problem solving skills that will allow them to thrive no matter what their futures hold. Participants go on an imaginative journey to Mars to work out what what a colony there needs first if it is to be a thriving, sustainable community. Along the way, they experience creativity, community, planning skills, project delivery and storytelling – all of which they can directly apply to support their learning and success in everyday life. Over the final weeks of 2017, students at Bulimba State School in Queensland, Australia, have been supported by their school?s Parents and Citizens? ?Association to?go on just such a journey . The school already has an extensive gardening program in which all students from preschool to year 6 participate. Having the space seeds available meant that students could extend the knowledge they already have to a whole new level, and become probably the first learners on their continent to grow space seeds. 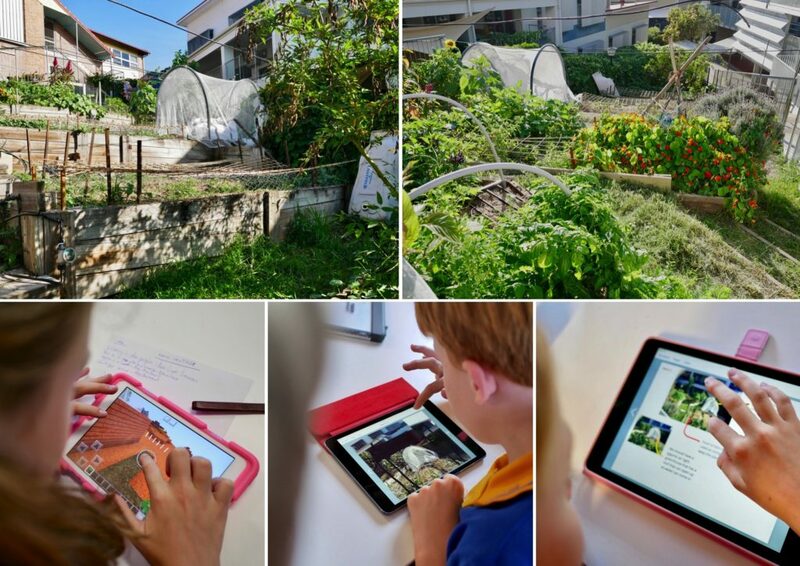 They began by touring the schools gardens and pretending they were actually on Mars, then used Minecraft and digital apps to plan how the gardens could be better designed for Mars. On this journey the students were joined by local ecologist Stephanie Slade who helped oversee the equipment and planting materials necessary. Also assisting was Australian Astrobiologist Richard Blake. Richard, who has spent time as an analogue Mars astronaut responsible for the greenhouse at the Mars Desert Research Station in Utah, USA, answered a number of student questions by Skype, and explained what the five things plants would need to grow on Mars would be: soil, sunlight, nutrients, a heater and sometimes a cooler. The next stage saw students actually planting the seeds in a controlled way that featured non-space seeds being planted at the same time as a control or comparison group. The two types of seeds were also distributed evenly between soil and cotton wool to provide further scenarios for the students to investigate. 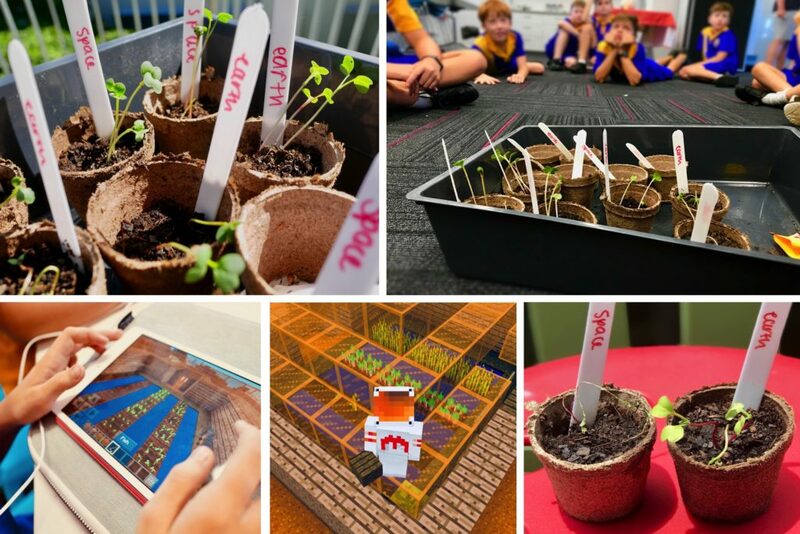 Once successfully planted, the seeds spent the time each week in between First Kids on Mars sessions being cared for in the classroom of year 3 teacher Matt Lee. Week 1 saw about 90% of all the space and Earth seeds in soil germinate and grow at least 3 cm. This was of great interest to the students – with them observing that the space seeds appeared to be growing the fastest. They also observed that only 20% of the seeds planted in cotton wool had germinated. They concluded the lack of soil was a crucial factor in this development. Week 2 brought some bad news, with 50% of the seedlings of both groups wilting. Students conducted an investigation based on what Richard had explained with various solutions being presented. Students then completed further Minecraft designs to show what an improved garden environment might need to look like. By week 3, the final week of the program, it was clear that being left unattended over weekends when the school was closed was proving fatal for the seedlings, with only 10% left alive. Despite this sad outcome, the motivation it provided students to problem-solve so that another trial next year is more successful was almost worth having this die-off occur. Hopefully 2018 will see the students applying their new findings to a second round of planting. The story will continue! Jonathan is a space-freak who earned his Commercial Pilots Licence at 18, and a Journalism qualification at 20. 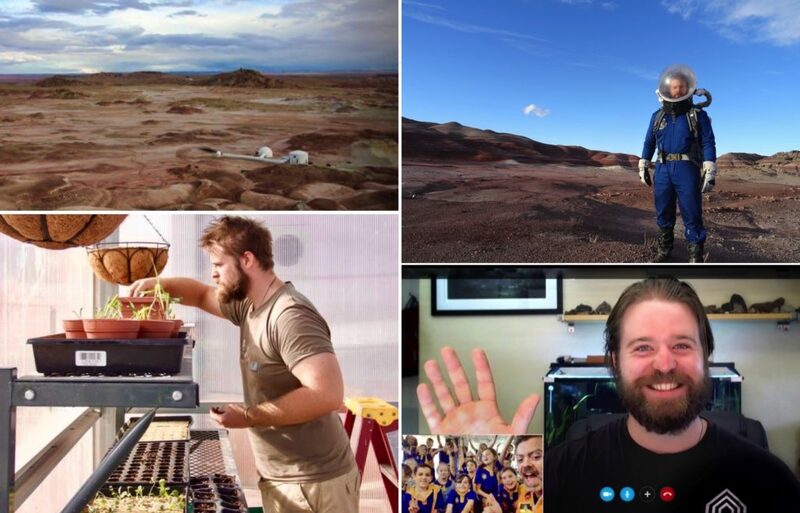 He then spent 18 years as an Educator and storyteller before dedicating himself to blending Process Drama, tech like VR, AR and Minecraft, Agile planning practices and storytelling to create the First on Mars experience. This program uses the playful scenario of taking fresh ideas to a new world to teach learners of all ages the skills they need to thrive in a fast-changing world.